What do you get when you add up the first Wednesday evening Sunset Paddle of the with BREC Outdoor Adventure, another unexpectedly long work day, and a fun paddle tour? 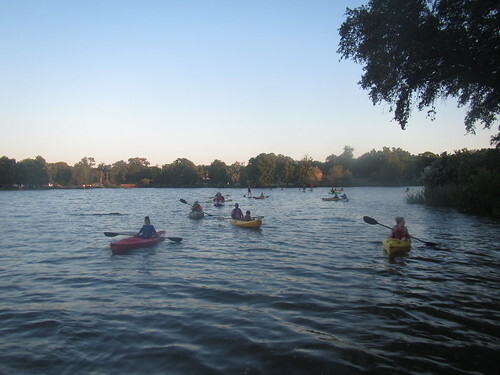 During the summer, the Sunset Paddles with BREC Outdoor Adventure have moved from Friday evenings to Wednesdays. We just had the first one, and the weather was fantastic. Well, except the wind, which was a bit much. Eventually it died down enough that the adventurous half went off to paddle around the lake while the rest enjoyed the sunset while sheltered from the wind by the point. It turned into an excellent evening for all. 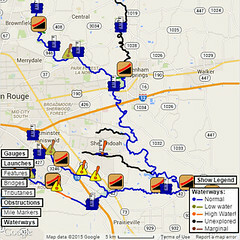 I had Friday off, so I figured I’d head out to do paddle trail maintenance on Bayou Fountain in advance of a fun out-and-back trip Saturday. It turned out to be a good idea, as no sooner had I started than I found a new fallen tree basically right on top of the one that recently fell right there at the park. After dispatching it, it was onward down the bayou. The water level was just low enough to scrape under Rackley Bridge, and everything seemed to be flowing along pretty well in the very mild current. It was starting to feel like it should be a pretty easy day as we passed the Palmetto House, but the feeling soon passed as we hit more trees. It seemed to be vine week, as the fallen trees were all webbed through and through, but there wasn’t much poison ivy, so we’ll still call that a win. Fallen tree number four was a rather tall chinese tallow. They may be an invasive species with lots of downsides, but at least the wood really cuts easily. We left it in large sections and pulled them to the side. We may see the pieces again and have to deal with them later, but hopefully not. It should be far enough downstream not to be likely to cause issues. One more tree rounded out the trip downstream. The trunk had split open near the base (possibly when a big section of an old dead locust tree landed on it, from the looks of things), and it was only half-fallen. As we pieced it apart, the rest kept springing back higher, and eventually we called it good enough and headed down to our turnaround point at Bayou Manchac. Normally, we work issues one after another in order as we head downstream, but tree number two on the day was special. To get to the trunk and branches, you had to hack through a huge sheath of vines, but that was the easy part. The trunk and all the branches were covered in some of the craziest thorns we’ve had to deal with. 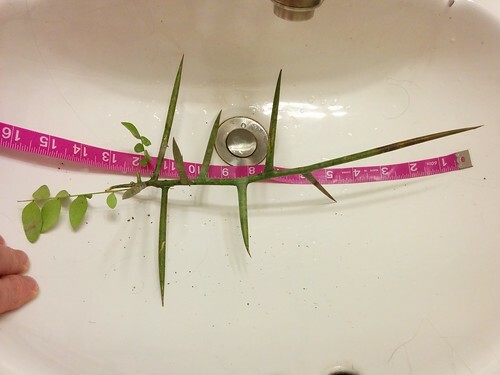 We had to “shave” the tree to remove enough thorns to carefully tie off each piece. Hopefully the pieces won’t get free, as they were positively vicious. How vicious? Here’s an example of what was growing everywhere right out of the trunk. So, that’s all the behind-the-scenes work that made Saturday’s paddle trip so fun and easy. We brought a trailer of canoes, and we even threw on a kayak by special request so one of the guest paddlers could see what kayak paddling is like. It was a great day for a nice out-and-back trip, and a great time was had by all.